A rare sacred chime of unknown origin. Can be used as a shield. slightly augments the effects of miracles. Use strong attack to emit miracles and hexes. After the Royal Rat Vanguard boss fight, past the the Rat King, drop down using the sticking-out coffins to a stone bridge. You'll spot the treasure at the edge of the room, to the left of a chest. A running jump will get you there. You can also get this on the way to the The Gutter from The Pit. After making your way all the way to lowest archway, you will encounter a room with a bridge. Across the bridge is a chest with the Ash knuckle Ring. You can jump from the side with the chest to the ledge with the Chime. It is a tricky jump, but so is the one from Grave of Saints (and you need not kill any bosses). Beware that when you fall in the area below the bridge you will be ambushed by exploding Undead Citizens. Take a swig off your estus flask the second your feet hit the ground and be ready for them to come at you from both tunnels. Technically, this item seems to be in The Pit, since you never receive the "Grave of Saints" area transition message when entering this area from The Pit. However, The Pit isn't even an official "level" so, maybe this is still technically Majula? Can be used to block like a shield. Using the strong attack casts hexes and miracles. Boost miracle power by 3% while wielded. 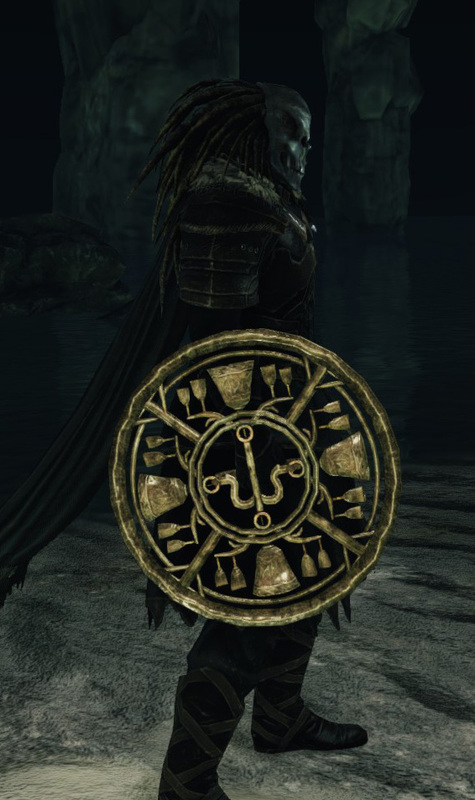 Unlike actual shields, upgrading the Disc Chime does not improve its resistances. Infusions, however, do alter them slightly. 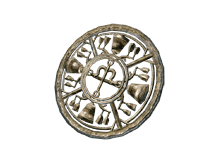 Seems to use much more stamina to cast than other chimes, possibly as a result of it being a "strong attack". It is possible to achieve over 1,000 AR with this weapon, with the right build.